Taylor Swift played one show in 2016. Last night in Houston, TX, she told the crowd at DirectTV’s Super Saturday Night, “As far as I know, this will be my only show in 2017. So, by attending tonight’s show, you are attending 100% of my tour dates for 2017.” Swift, per usual, did not disappoint. The show, which was more of a party, was hosted by DirectTV and AT&T in promotion of their new DirectTV Now service. The venue in which the show was held, according to Swift, was constructed only two weeks earlier. The structure was completely white and as attendees approached the building, undoubtedly the first thing they noticed were the glowing projections that lit up the outside of the building. Videos in promotion of the show rolled across the entire exterior walls of the structure. Once inside, attendees were greeted with two light-up bracelets which we were told, were “gifts from Taylor”. In addition, the rumor going around inside was that Taylor paid for the open bar. Celebrity attendees included Chris Evans, Chrissy Teigen, Common, Diplo, Eli Manning, Jeremy Renner, John Legend, Normani Kordei, Peyton Manning, Shaquille O’Neal, Simone Biles, Thomas Rhett, Tim Tebow, and Vince Vaughn. Taylor took the stage around 11:30PM CDT and opened with “New Romantics”, an upbeat pop single from her latest album, “1989.” The crowd went nuts as their bracelets lit up in accordance with the beat of the song. Swift played through several of her popular songs from “1989”, but also strapped on her acoustic guitar and did two songs we’ve never seen performed live. First was her duet with ZAYN for the “Fifty Shades Darker Soundtrack”, “I Don’t Wanna Live Forever.” She then did a song she wrote for Little Big Town “Better Man”. Both of these tracks have been charting on radio for the past few weeks. 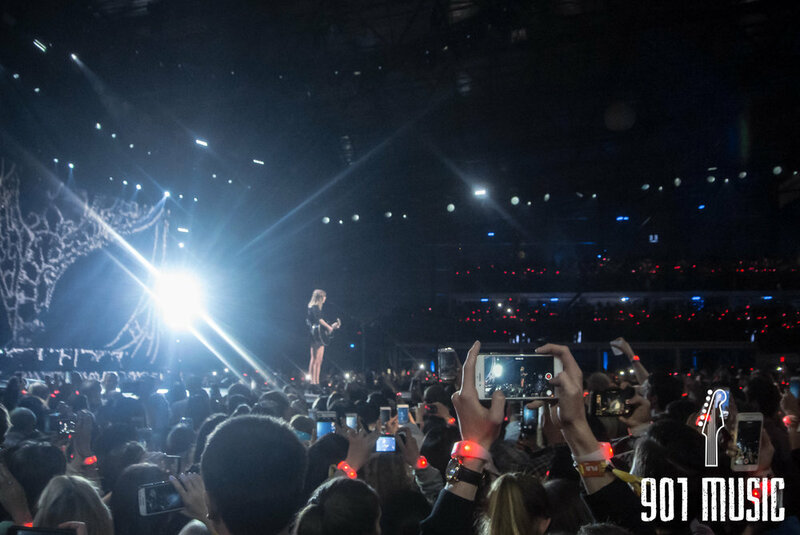 Taylor closed the show with her smash hit and first single from “1989”, “Shake It Off”. The crowd danced as confetti fell from the ceiling of Club Nomadic. Hopefully, we will see more from Taylor in 2017. But if not, this was an incredible way to open (and close) her 2017. Photo credits: @NathanArmstrong | *All photos were taken with a venue approved non-professional point & shoot camera.